What’s holding IOS better than ANDROID???? Ios & Android both have their pros & cons, and mostly it depends on personal preference. Most of us love our smart phones and mobile devices, because they’re pretty great, but it’s good to look at both sides . When we talk about Android it’s just Linux based operating system & ios an operating system for iphones. So what’s makes these 2 different???? 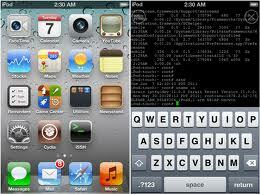 Apple ios is an operating system whereas Android is Google developed open source operating system. According to spaceport.io, ios works 3 times better than android if we talk about HTML 5 games & apps. Android tablets perform poorly despite their powerful hardware. Some like the Galaxy Tab perform moderately well, but only with certain specific animation techniques. If we talk about consistency of a device ios is best suited its name for its consistency or you can say ios is nothing if not consistent. In Apple, there is update fragmentation only between phones & tablets. While in Android it’s between different phones & tablets. So Android will be taking more time for that. Also lack of consistency in Third party applications in Android also a problem. User Interface of IOS is more pretty & Intuitive than Android. Also if we talk about variety of apps in both ios is still one step ahead. Ios has some of the most elegant, polished, fun, and even useful apps. They may be a bit restricted than Android apps, but it’s not like you can’t jailbreak if you’re looking for more. The battery life for ios is far better as compared to android. Apple’s battery management tactics are so good that it is also said amount of water in humans is same as the battery in ios. There are plenty of alternatives of airplay, but none that work quite so elegantly and intuitively. Two-tap video streaming in ios is awesome & won’t find such a nice solution on Android. IOS designing, user interface, battery life, consistency, gaming & apps all these things make IOS a far better than Android. 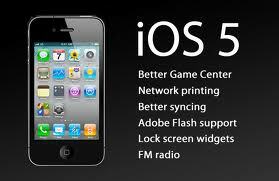 IOS VERSION 5 :A SUCESS OR FAIL???? IOS version 5 which was released firstly on Apple 3rd generation phones was introduced by Steve Jobs at WWDC. It was released for iPhone 3GS, iPhone 4 (GSM and CDMA), iPhone 4S, iPod Touch (3rd and 4th generation), ipad, and ipad 2 on October 12, 2011. IOS now supports1080p video resolution & different new Third party apps like Netfix, Youtube, NBA, flicker which have their own specialized icons. It also allows user to create Net fix account. In earlier versions apps download speed was just 20 MB but version 5 comes out with 50 MB downloading speed for 3G. Also while using games in APPLE u have to purchase it from App store & u can’t share your score with anyone but now you can play & share gaming with your friends. You must be fed off with connecting your device to pc & laptop for document transfer, ios 5 brings you with sharing data wirelessly using icloud. Assistive touch & camera have improved to quite greater extent that you can now edit your photos on device itself. Also improved quality of camera helps in face detection with best picture quality. Ios 5 has built-in Twitter integration so we can rapidly tweet a photo, You Tube video, etc. iQuick Tweet smartly took that rapidity and made it the focus of a dedicated app. You type a Twitter status, you hit send, and you’re done. It’s just that simple and it’s just fast. Publish the latest issues of your magazines and newspapers directly to Newsstand. Newsstand Kit provides everything you need to update new issues in the background, so you can always present the most recent cover art. ICloud Storage enables apps to store user documents and key value data and wirelessly push any changes to all user’s computers and devices at the same time. Some of the applications will even compete against existing third-party applications including Postcard On the Run, Postgram , Flixster, Can’t Wait!, Neer and Glympse. In spite of all these advantages we can’t say it’s perfect. 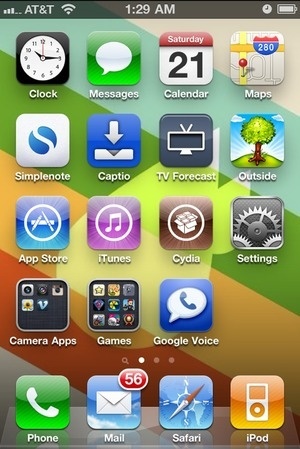 “As nobody is perfect” as such with ios5. It can’t be used for tabbed browsing in iphone/iPod touch. Also custom or stock vibration for ipad is not good. Multitasking gestures are not provided in this. The biggest problem incurred in ios 5 is while its installation on ipad. There were also issues regarding 3200 or “internal error”, for those who try to update their devices. Now APPLE has solved this problem for that you have to download itunes. *No notification centre on lock screen. *Can’t reply to text messages from the lock screen or from within other applications. Its features are so good that it can be thought a success keeping aside its cons. Latest version for ios is up coming for iPhone 5. It’s believed that is would solve all bugs related to version 4. For its latest updates keep visiting blog!!!!! Apple Design Awards for best ios & OSx developers are conducted every year for the nominations of outstanding Applications and the winners are announced at WWDC (World wide Developer Conference). This year will be no different. Apple has officially started accepting nominations for 2012 Apple Design Awards. If you come across a really cool application for your APPLE mobile you can nominate it. For that you have to visit Apple’s WWDC awards website and login with your developers ID to nominate your favorite app. The nominations for best ios & OSx will not be on the basis of strength of nominations rather it must be on the 3 criteria’s. Firstly application must be “well designed” (those which are attractive, easy to use, and understandable). Secondly it must be “innovative” (new & revolitutionary ideas). And most importantly “Art” (system integrated, having richest technologies & taking advantage of latest hardware). Criteria for nomination also include availability of application on the App Store or the Mac App Store by May 1 of this year. You can view last year’s winners to get a taste of the kind of excellence required for winning. IPhone apps: Infinity Blades, Cut the rope, Golf scape GPS rangefinder. Ipads apps: djay for ipad, Osmos, Our Choice. Mac apps: Capo, Pixelmator, Anomaly Warzone Earth. The awards are based on different criteria every year since Apple began the tradition in 1996. The winner of the awards will be announced in Sanfrancisco from June 11 to 15.